Niklas Backstrom, who was named the Finnish Elite League goaltender of the year in his second season with Karpat Oulu after leading the team to the league championship in 2003-04, was the backup to Manny Fernandez in 2006-07 before earning the starter's role at the start of last season. "When Manny got hurt Nik carried us and played 18 straight at one time so we knew of his durability, so that was never a question," Wild goaltending coach Bob Mason told NHL.com. "He never had any down time and was sharp from that point forward." Backstrom tied the single-season franchise record with five shutouts in his first season and ranked first in the NHL with a 1.97 GAA and .929 save percentage in 41 games. He and Fernandez combined to win the William Jennings Trophy in 2006-07 after the Wild allowed a League-low 191 goals. "Manny was a great help inside and outside the rink," Backstrom said. "He showed and told me what I needed to do with time schedules and everything else. On the rink, he gave me the scouting report on teams that were good and what I needed to do and what I needed to be careful with. He was a good teacher and took good care of me." When Fernandez was traded to Boston in July 2007, Backstrom was ready to carry the load. "Whenever you have a chance to play in the NHL, it's a dream come true, but you can't think too much about that," Backstrom said. "You have to focus on your work and do your best to be ready to play every day. If you're not playing well than someone else is going to take your job, so you can never be satisfied. You have to compete and take small steps, and if you earn a spot on the team, you have to just focus on playing well." Playing well is an area Backstrom certainly has mastered. 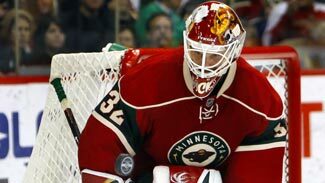 MONTREAL -- Bob Mason likes to refer to Minnesota Wild goalie Niklas Backstrom as "Mr. Consistency." It's tough to argue with the assessment. As the Wild's goaltending coach, Mason is a witness to Backstrom's insatiable appetite to succeed each day. "Nik works hard on his game, and ever since we started playing him a couple of years ago, he's been 'Mr. Consistency' because he puts a lot of work into his game, is focused and sticks to a routine," Mason told NHL.com. "He doesn't like change and it's paying off for him." After establishing franchise records with 33 wins and 1,498 saves last season, his first as the full-timer, Backstrom now is doing it again. He's tied for fourth in the League in victories (22), is fifth in goals-against average (2.22) is sixth in save percentage (.926) and tied for second in shutouts (five). Backstrom also became this season's first goalie to shut out the Boston Bruins, the top team in the Eastern Conference, with 28 saves in a 1-0 decision Jan. 6. The goose egg enabled him to record back-to-back shutouts for the second time in career -- he also made 33 saves in a 2-0 defeat of Colorado Jan. 4. "If you believe in something and work hard enough, then you have a chance to achieve your goals," Backstrom told NHL.com. "I just want to be the best goalie I can be, but I know that's a long way off." Well, not really. With exceptional numbers in just about every statistical category, Backstrom was chosen to represent the Western Conference in his first NHL All-Star Game later this month in Montreal. "He's kept us in games that maybe we didn't deserve to be in and actually won," veteran forward Owen Nolan said. "This is well-deserved because he's been playing great for us." It's an honor Backstrom, who was hooked on the position as a youngster after watching his grandfather and father stand between the pipes, doesn't take lightly. "It's a great honor, but I realize I didn't get there myself; I have to really thank my teammates," he said. "There are a lot of great goalies out there and I know it's hard to choose one, but it's a great honor to be picked." Wild coach Jacques Lemaire agrees that an All-Star selection is a team honor. "There are certain trophies that may be looked at as individual awards, but I feel that in order to be considered one of the top goalies, you need a good team around you," Lemaire told NHL.com. "You need good people around you. Not that Nik doesn't deserve what he gets, but if the defensemen or forwards don't do their job, it would be more difficult for him." Josh Harding, Backstrom's backup this season, admits his teammate deserves everything he gets. "He's a mentally focused guy and has a routine that he follows," Harding said. "As far as his work ethic goes, I don't know if there's a guy on this team that works harder than Backs. When he doesn't have to be in the gym, he's in the gym, and when there's an optional skate, he usually takes it. "It's definitely a good learning ground for a guy like me coming into the League. But he deserves everything he gets and the All-Star Game is a credit to him and how hard he's been working. He's been our backbone all year." Rookie right wing Cal Clutterbuck, who ranks among the top five in the League in hits this season, is amazed at Backstrom's durability. "I think if there's one guy that you had to pick for the All-Star Game, it's Backs," Clutterbuck said. "He's so reliable and so consistent, and that's all you could really ask for in a goaltender. He goes above and beyond the call of duty as far as winning games for us single-handedly, makes the big saves and makes the routine saves. It's a credit to him because he works extremely hard." Lemaire, who has coached his share of top-caliber goalies, including Martin Brodeur in New Jersey, ranks Backstrom near the top of his list. "What pushes Nik is his desire to improve," Lemaire said. "He came into this season really focused on his job and he's at his best right now. He's great on the first shot because he's a great positional goalie -- always looking to gain the initial edge on the shooter. You really have to place a perfect shot on Nik to beat him. He won't give a lot of bad goals and has been very steady. What you see is what you're going to get with Nik." The 30-year-old Backstrom, who was signed by Minnesota as a free agent in June 2006, agrees with his coach. "I play for right now," said the 6-foot-1, 189-pound native of Helsinki. "I think you always want to get better and there is always room for improvement. There are always things in your game you want to work on and I want to be better than I am now."